WATER: Who controls it? Who benefits? THIR$TY takes on the privatization of water, while asking questions about the commodification of "nature's life blood". Globally, the corporate race is on to privatize water sources and the systems that treat and deliver drinking water. A handful of huge multinationals are jockeying for a share of the potential annual US$1 trillion water market. Should water be a basic human right or a commodity to be owned and sold? Who should control it? To whose benefit? Water Quality: How much of our water is actually safe to drink? In the wake of water-related tragedies like Walkerton, Canadians have woken up to the need to protect our water sources and systems. Ensuring these standards depends heavily on maintaining government control over regulations and policy. This is not the direction we are currently headed in. Water is not just for drinking, though, the planet's ecosytstems depend on it. What are the impacts on human communities, animal and plant species, of the thousands of dammed rivers for hydropower generation, water diversion for irrigation, and allowing agricultural and industrial outputs to run into surface and groundwater sources? Water Bottling Industry: Huge quantities of Canadian water is already being removed from lakes, streams and underground aquifers to fill millions of plastic water bottles. Battles against these companies across Canada articulate the huge environmental impacts of this poorly regulated and controlled industry. Meanwhile, Canadian consumers, responding both to fears about water quality and to slick marketing from bottled water producers, are turning off their taps and paying for bottled water. What are the social and environmental implications of this shift toward bottled water consumption? What are the alternatives? Bulk water export: Here in Canada, the debate around selling our water is starting to boil. Pressure to export water in bulk is being pushed by the USA, and this will only intensify in coming years. What does it mean if we open our taps for bulk water exports? What are the risks under global trade agreements like NAFTA? And do we really have water 'to spare'? Water: for life or profit? : The issue is a global one. We are told the move to privatize is 'inevitable'. But is it? What is the role of governments in providing public services? How can we address the challenge of improving our systems without handing away control? Large multinationals are buying up rivers in Columbia. Indigenous communities from Costa Rica to India are being flooded and displaced by the construction of major hydroelectric projects. Water systems are being privatized from Great Britain to Ghana to the Phillipines -- a move which has led universally to huge hikes in water rates, compromised water quality due to short-cutting, and the denial of this essential resource to those unable to pay their bills. Global resistance: But from Bolivia to South Africa to Canada, and everywhere in between, communities are fighting back, in struggles to establish, maintain, or regain, democratic control over their water. In 1999, the government of Bolivia privatized the city of Cochabamba's water system, handing over control to the US giant Bechtel. Almost instantly residents experienced massive rates increases, cut-off supply to those who could not pay their bills, and the expropriation of community-owned water sources. They responded with what became a massive popular uprising to regain control of their water. They succeeded in forcing their government to reverse the decision to privatize, and the company out of Bolivia. The water system in Cochabamba is now being run by a democratically structured, citizen-controlled water body. Despite having never invested a penny in the Cochabamba water system, Bechtel is now suing the government of Bolivia for $25 million in lost profits under the terms of an international trade agreement. 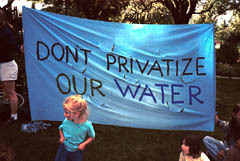 In July of 2001, residents here in Vancouver engaged in a heated public battle against GVRD plans to privatize our local water filtration; people from diverse walks of life spoke eloquently about the risks of posed by global trade agreements and their strong belief that water must be controlled through democratic, public bodies. This fight mirrored countless other going on worldwide -- struggles to maintain water for people not profit. In New Zealand, organized squads of regular citizens are digging up water lines to reconnect their neighbours' cut-off water supplies. These struggles are all linked, through the global nature of the agenda to privatize and commodify water. We often hear that the shift toward water privatization is 'inevitable', but is it? What are the alternatives? What do we want to see happen? Following every THIR$TY performance, Act II features guest speakers with expertise on various topics. The counteract will invite audience discussion and focus on solutions and community action. world's fresh water from the growing threats of trade and privatization. West Coast Environmental Law (Vancouver, BC) * Excellent information.